The tires of five vehicles were punctured during the night in Jerusalem's Old City. A nearby wall was sprayed with the words "price tag". Police are investigating the puncturing of tires on five vehicles, Monday evening, on Derech Ma'ale Hashalom in Jerusalem's Old City. The Hebrew words for "price tag" were spray-painted on a nearby wall. Passersby noticed the graffiti and the slashed tires and called the police. An investigation of the event was launched. It appears the "price tag" phenomenon is becoming increasingly prominent. 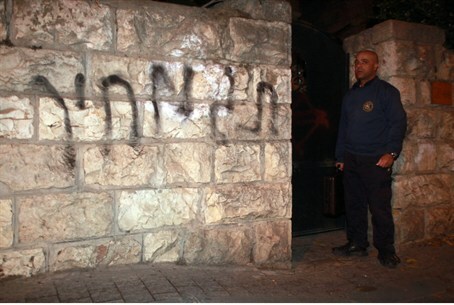 The phenomenon - usually manifested in acts of vandalism or criminal damage against Arab and left-wing targets, and occasionally Israeli security forces - has been blamed on nationalistic youth, who police say carry out such attacks in response to attacks or threats against Jews in Judea or Samaria (Shomron). However, Arab and left-wing activists have also been exposed as having fabricated alleged Jewish "Price Tag" attacks on numerous occasions. A lesser-reported phenomenon of Arab "price-tagging" is also on the increase, particularly in Jerusalem. Yesterday, an IDF memorial to fallen soldiers was defaced with Arabic graffiti, in a suspected nationalistically-motivated crime. On Monday, policemen arrested four students from Mt. Zion’s Diaspora Yeshiva whom they claim were engaged in the smashing of gravestones in the Greek Orthodox cemetery near the David’s Tomb complex. The four, aged 17-26, deny all allegations, saying all they were doing was making their way to ritual baths nearby. The second report of vandalism this week came early Sunday morning, when two Jewish teens were arrested under suspicion of damaging eight Arab vehicles in the Shimon Hatzaddik neighborhood.